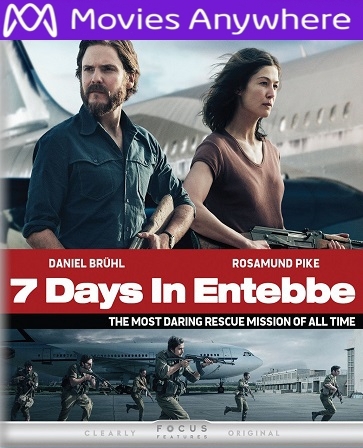 Digital UltraViolet and Digital Copy will makes it possible for you to stream the movie 7 Days in Entebbe HD UV Code instantly to your computer and compatible Smartphones, Andriod, iphone, iPod Touch, iPad and tablets devices anytime, anywhere. You can also download a Digital UltraViolet Copy or a Digital Copy of the movie 7 Days in Entebbe HD UV Code to your computer and compatible devices. An act of terrorism leads to one of the most daring rescue missions ever attempted. When a commercial flight is hijacked in 1976 and diverted to an abandoned terminal at Entebbe Airport in Uganda, the terrified passengers become bargaining chips in a deadly political standoff. As the likelihood of finding a diplomatic solution fades, an elite group of commandos hatch a fearless plot to rescue the hostages before time runs out. Daniel Brühl (Captain America: Civil War), Rosamund Pike (Gone Girl) and Eddie Marsan (Atomic Blonde) star in this riveting thriller inspired by true events.